The event was the Scribante circuit’s first wet race day since the venue’s recent resurfacing, which made its traction extremities difficult to read. 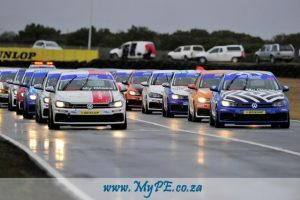 The treacherously slippery conditions did nothing to alter the Engen Polo Cup contingent’s murderously competitive nature. Saturday morning’s official qualifying session saw the times of the top ten competitors covered by less than a second. The second race saw a multiple pile-up in the circuit’s hairpin corner, putting out Mogotsi and dropping Pepper far down the order. The incident caused the deployment of the Safety Car, in order to remove Mogotsi’s damaged and stranded vehicle from the circuit.